For thousands of years and today it has to be the most loved and used essential oil, probably the one with the widest impressive use of applications. Lavender is safe, versatile and gentle and may be used undiluted over small areas. The essential oil with it's “balancing” qualities is steam-distilled from the flowing tops to aromatic leaves. Lavender Angustifolia – for it’s softer, sweeter scent, English lavender is not from England at all but from southern Europe, where it is cultivated for the perfume industry. The perfume is comfortingly familiar, fresh, clean, floral and soft and it blends with most other oils. Lavender is one of the most valuable oils for skin care And skin conditions as it stimulates the growth of new cells, kill bacteria, prevents scaring and eases pain. Uses it to treat abscises, acne allergies, athletes foot, boils, bruises, inflammation, dermatitis, eczema, insect bites, stings and replant, psoriasis, scabies, sunburn, burns and scalds (minor), sores, skin spots, ring worm and wounds of all kinds. Include it in deodorants too as it reduces body odour. Lavender increases energy – quickens the function of glands – strengthens bodily systems – eases problems with digestive – repertory and urinary systems – relieves cramps and spasms in the intestines and uterus – stimulates bile production – help to expel gas from the intestines – encourage and regulates menstrual flow. The antiseptic, antiviral and antibiotic properties combined with the ability to loosen and expel mucus make it an ideal oil to use as inhalation. A chest rubs for bronchitis, coughs, colds, laryngitis, and throat infections. Lavender is renowned for the effective relief of pain and inflammation caused by arthritis, lumbago, muscular aches and pains, rheumatism, sciatica, and tension pain. The best way of utilising lavender oil for these problems is in a synergistic massage or bath blended with other oils as it will strengthen their properties. 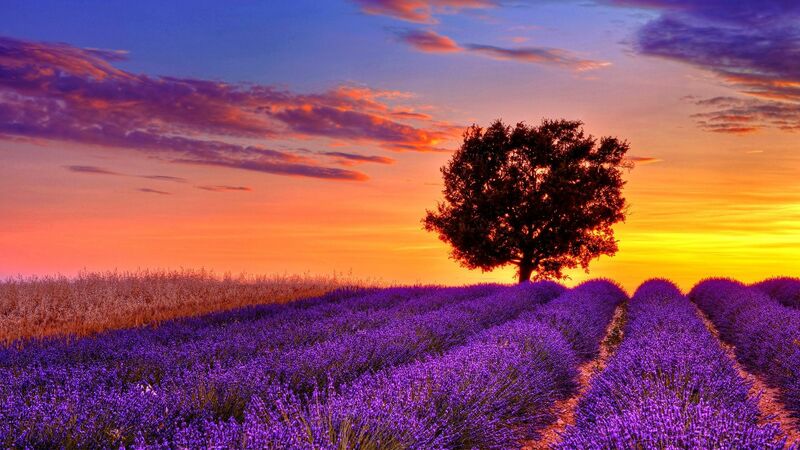 Beautiful lavender is the great leveller. It can create calm and order for mental chaos to harmonise and balance every aspect of our body and mind. It’s reduces stress and calms the nervous system, lifts depression and headaches and insomnia. Caution : Avoid using for the first four months of pregnancy and longer if there is a history of miscarriage. TIP – There in an old belief, if you wanted to stay chaste and virginal, you had to dry lavender flowers and sprinkle them upon your head. Definitely easier to use essential oils if chaste is what you desire ! Remember LAVENDER for almost everything . This spray is 100% natural and may relieve any discomfort from dryness and heat. 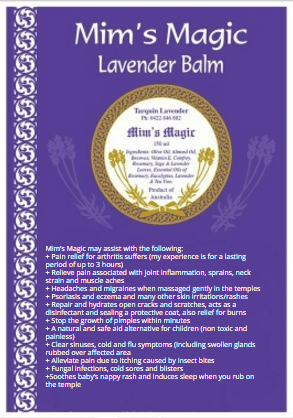 For the Love of it.. "Tarquin lavender Australia" the purpose of our business is to help share the experiences of our wonderful products ...Mostly the 1 called 'Mim's Magic Balm' I have been absolutely humbled everyday now by the balm! It's done so much for so many. There has been tuff roads but I stayed positive even when I too had lost heart. Knowing I help someone new everyday keeps me smiling. 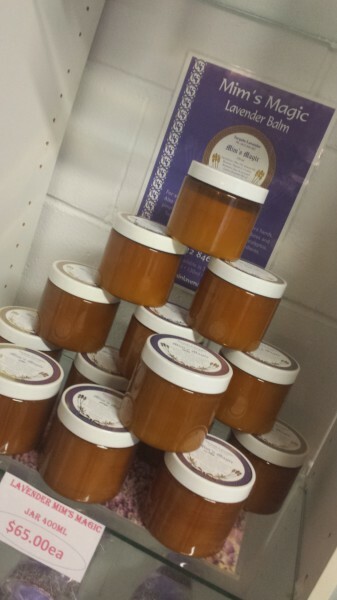 Locally made in Toowoomba - Try it yourself we do send free samples..... so we can pass the word around the world. As close to natural as possible, simply beautiful, imdulgent Lavender. Our product line reflects all that is beautiful about Lavender. Used since Roman Times, loved for generations and we are still blessed with it TODAY. Refund Policy : A minumin of 28 days from your purchase if we don't have a tracking number.